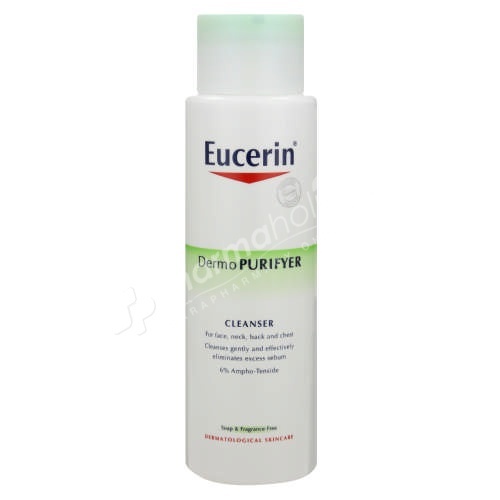 Eucerin DermoPURIFYER Cleanser is a daily gel, containing mild Ampho-tensides, for gentle yet effective cleansing. It is a daily-use, soap-free and fragrance-free formula for gentle, yet effective, cleaning for oily and blemish-prone skin. Eucerin DermoPURIFYER Cleanser is a daily gel, containing mild Ampho-tensides, for gentle yet effective cleansing. It is a daily-use, soap-free and fragrance-free formula for gentle, yet effective, cleaning for oily and blemish-prone skin. Containing 6% Ampho-tensides, it eliminates excess sebum (seborrhea) while removing dirt and make-up. Its anti-bacterial properties help rid the skin of bacteria and, as it is non-comedogenic, it will not clog pores. Clinically approved. Wet face. Apply the cleanser to hands and work into a lather. Apply to face avoiding the eye area. Rinse off with warm water.